This is a conservation story about butterflies and beer. 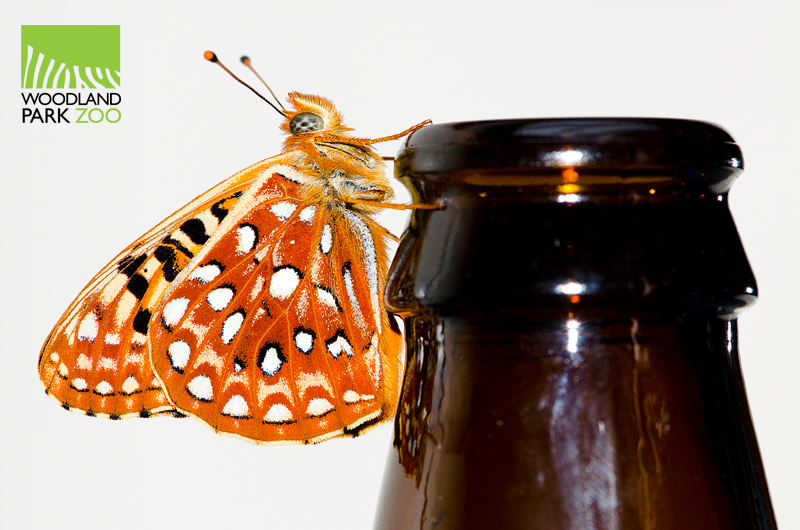 An Oregon silverspot butterfly lands on a beer bottle. It’ll all make sense by the end of the story, I promise. Photo by Ryan Hawk/Woodland Park Zoo. Where to start? How about we take it back to biology class. Remember learning about generalists and specialists? Humans are the ultimate generalist—we’ll live in just about any habitat and eat just about any food. 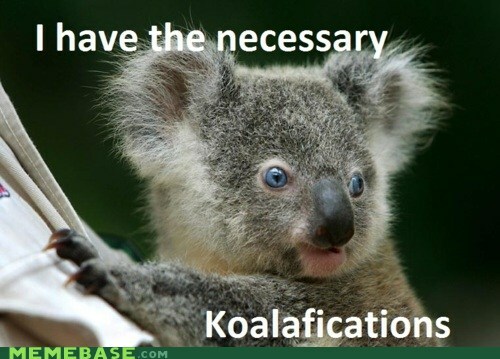 Then there are the specialists, like koalas and their eucalyptus-only diet. For specialists, survival depends on that one thing they specialize in. That one thing goes away, and they’re in big trouble. 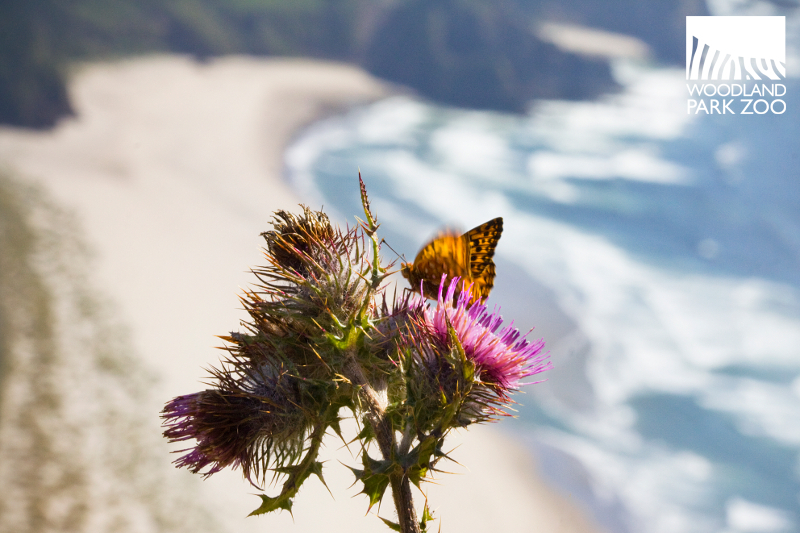 Oregon silverspot butterfly at Cascade Head in Oregon. Photo by Rachel Gray/Woodland Park Zoo. That’s what’s happening to the Oregon silverspot butterfly, a native of the Pacific Northwest and a specialist dependent on the early blue violet plant for survival. 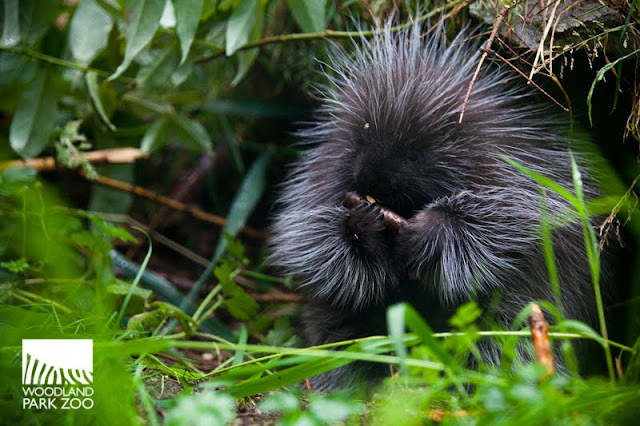 This threatened species once lived in Washington but has since been wiped from the state, and now only five wild populations remain in Oregon and California. 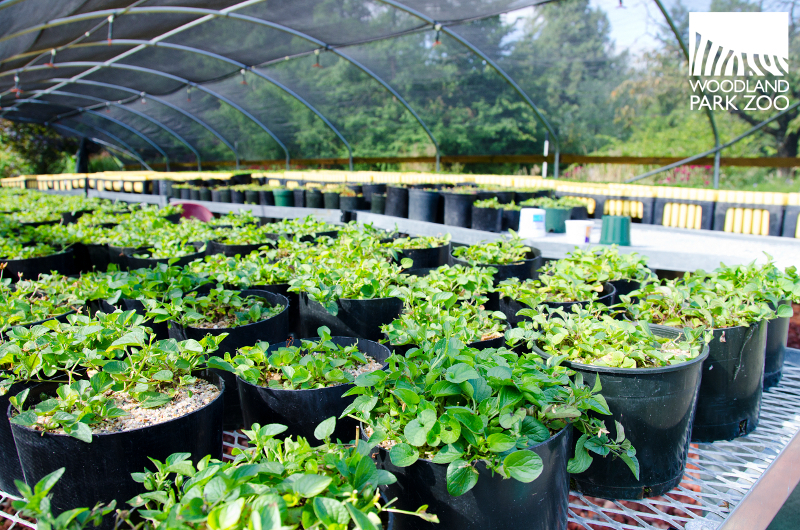 Growing violets at Oregon Zoo’s greenhouse for hungry, hungry caterpillars. 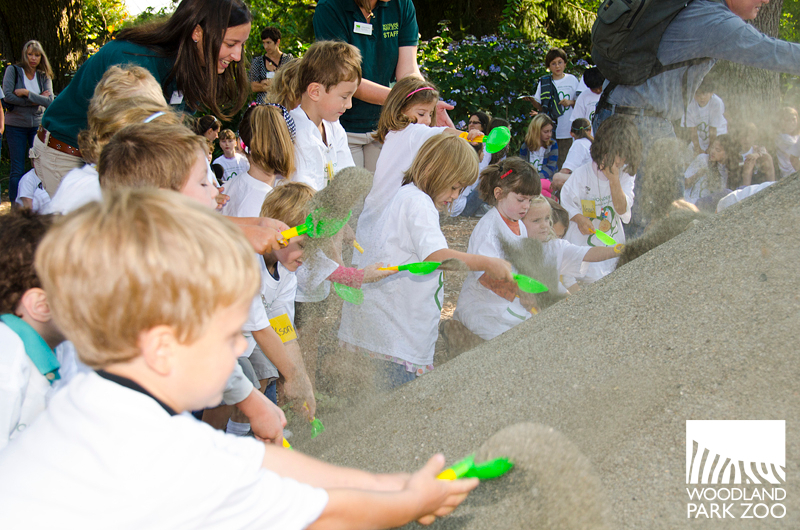 Oregon Zoo is a major partner in these conservation efforts. Photo by Ryan Hawk/Woodland Park Zoo. 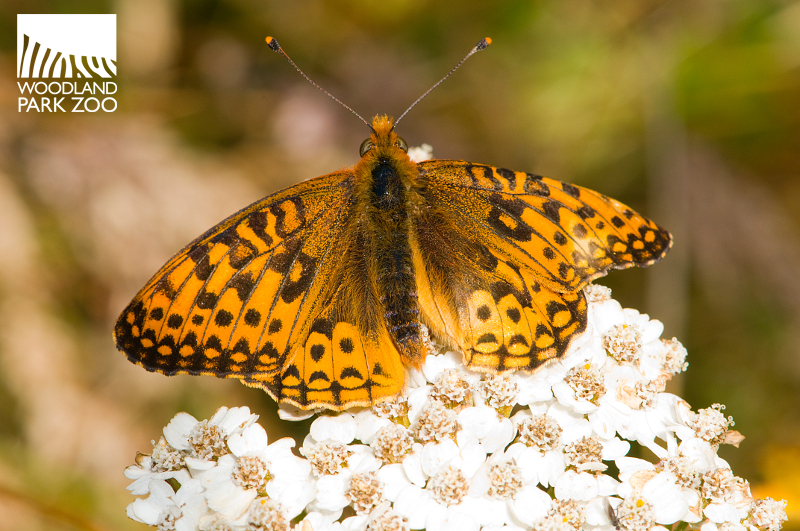 The Oregon silverspot butterfly needs the early blue violet, a low-growing native wildflower, to survive. Silverspots lay their eggs near violet plants, and growing caterpillars rely on the violet as their sole source of food on their path toward becoming a butterfly. But now the early blue violet is disappearing from our native landscapes. 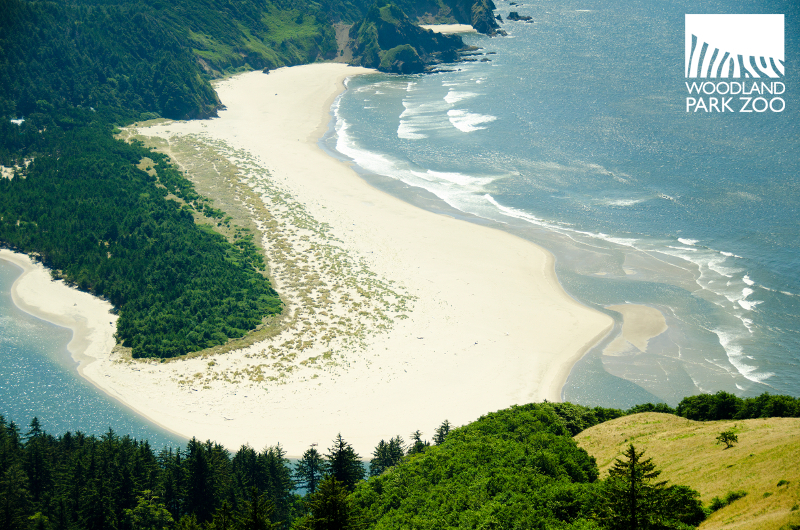 Forest meets meadow meets ocean at the beautiful Cascade Head preserve in Oregon. Why are the violets disappearing? The primary threats are forest succession and invasive weeds taking over. Invasive species are a major issue in wildlife conservation—they are one of the leading threats to biodiversity worldwide. When non-native species are introduced to habitats, they can spread quickly, often going unchecked because they have no native predators. They take over scarce resources and outcompete native flora and fauna, profoundly changing our local living landscapes. That’s what’s happening to silverspot habitat right now, with invasive scotch broom and non-native grasses taking over and choking out early blue violet plants. An Oregon silverspot butterfly shows off its wings. Photo by Ryan Hawk/Woodland Park Zoo. To save this butterfly, we need to save its habitat from invasives. Get those violets flourishing again and we’ll get the butterflies flourishing again. And if we get the butterflies flourishing again, we get the habitat flourishing again, since butterflies are such essential pollinators. It’s all connected. We raise silverspot caterpillars in a behind the scenes lab at the zoo as part of conservation efforts. Photo by Ryan Hawk/Woodland Park Zoo. Woodland Park Zoo is a partner in a conservation project—a project that just won a national conservation award!—that’s setting out to restore silverspot habitat and repopulate these butterflies in the Pacific Northwest. Our partners are restoring and protecting coastal meadow habitat, such as the Cascade Head preserve in Oregon, hard at work pulling, weeding, cutting and replanting to get rid of invasives. Then we help with the repopulating by head starting silverspots at our zoo. 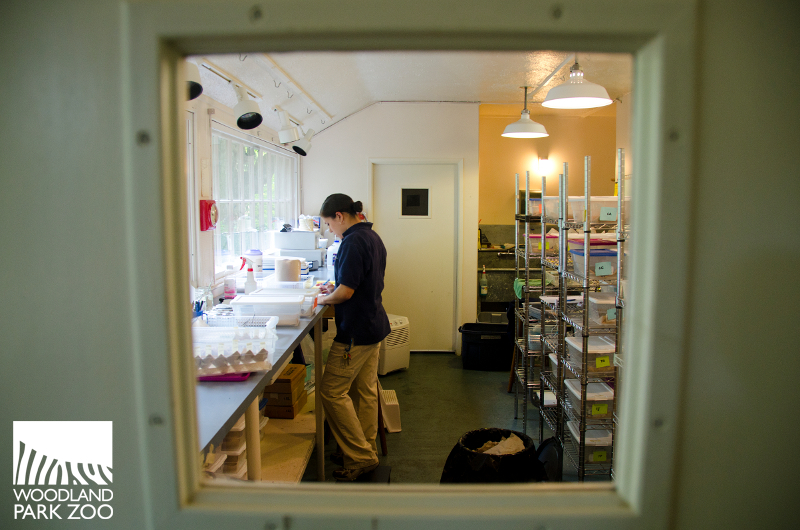 We collect eggs, hatch and raise them at the zoo until they are caterpillars, and then release the caterpillars to protected areas to help build up the wild populations. 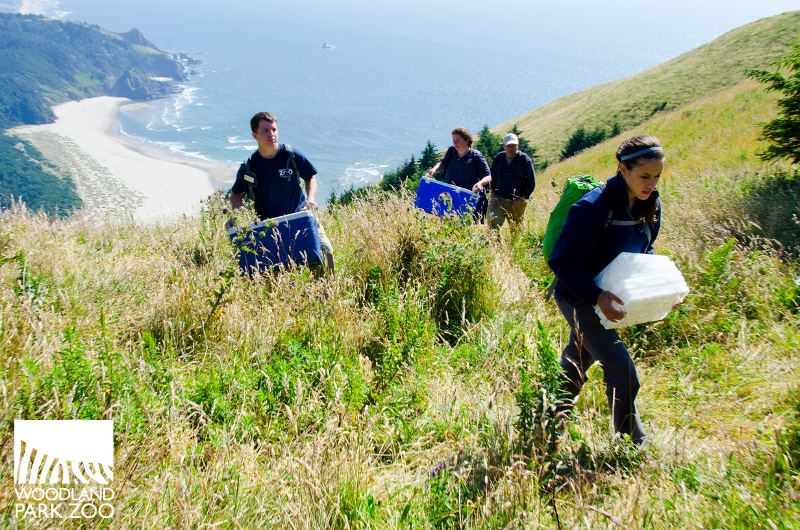 Zoo staff hike out to release caterpillars at Cascade Head. Photo by Ryan Hawk/Woodland Park Zoo. See, now it makes sense. Label artwork courtesy of Pelican Pub & Brewery. Oregon’s Pelican Pub & Brewery has just launched the Silverspot IPA, a delicious beer inspired by the butterfly conservation efforts at the Cascade Head preserve in Oregon, located just outside the brewery’s front door. A portion of the sales of this IPA goes directly to the conservation effort and helps make our work possible and the work of our terrific partners on this project, including United States Fish and Wildlife, Washington Department of Fish and Wildlife, The Nature Conservancy, Oregon Zoo, and Lewis and Clark College. 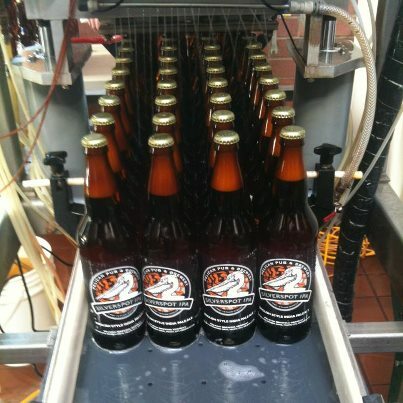 Silverspot IPA rolls off the assembly line. Photo courtesy of Pelican Pub & Brewery. 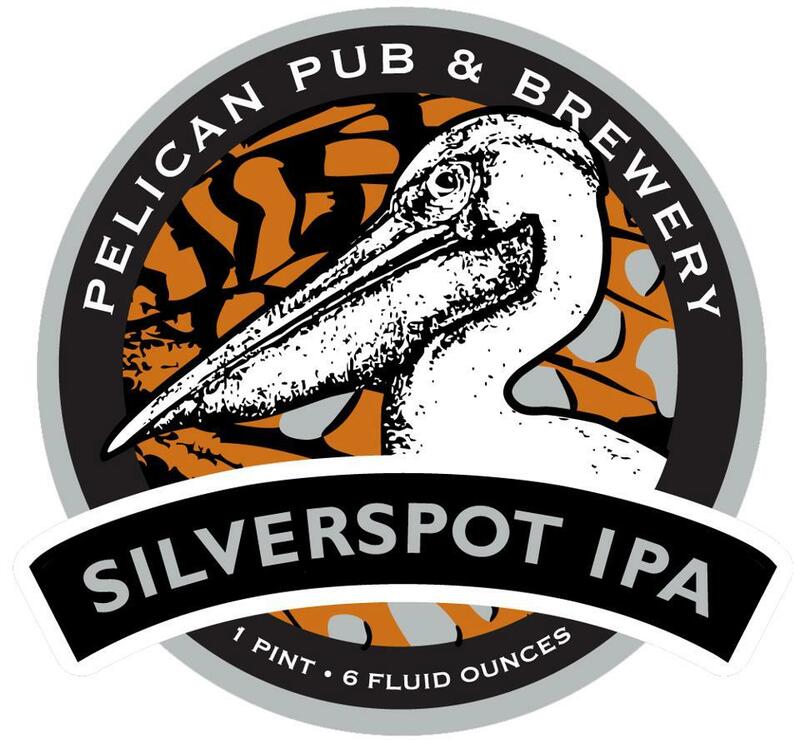 Silverspot IPA is available at Pelican Pub’s Oregon location and in select retailers in the Seattle area, including select QFC, PCC and Metropolitan Market locations. Please drink responsibly and make sure you say cheers to butterflies and conservation! Want to do even more for native wildlife? Keep your eyes on our Backyard Habitat class offerings to learn more about gardening with native plants to help control the spread of invasives in our local landscapes. 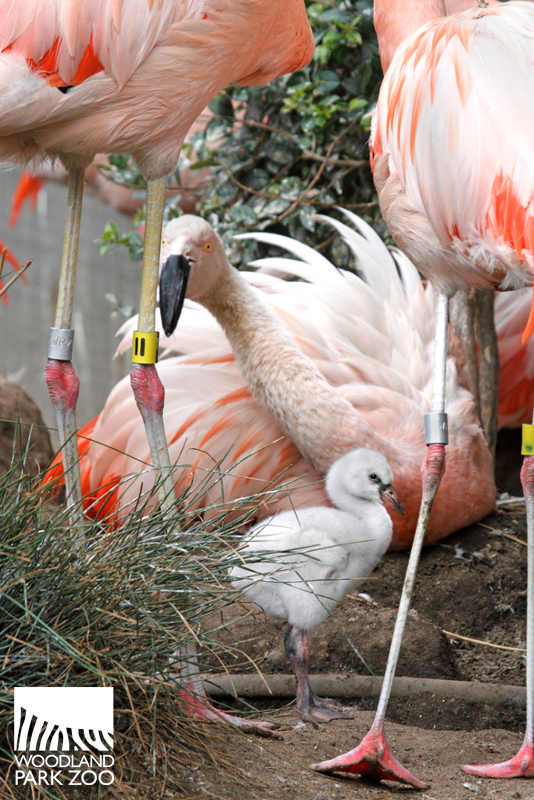 Our Chilean flamingos may be pretty in pink, but three recently hatched chicks are wonderful in white as their downy feathers haven’t yet taken on that classic blushed shade. 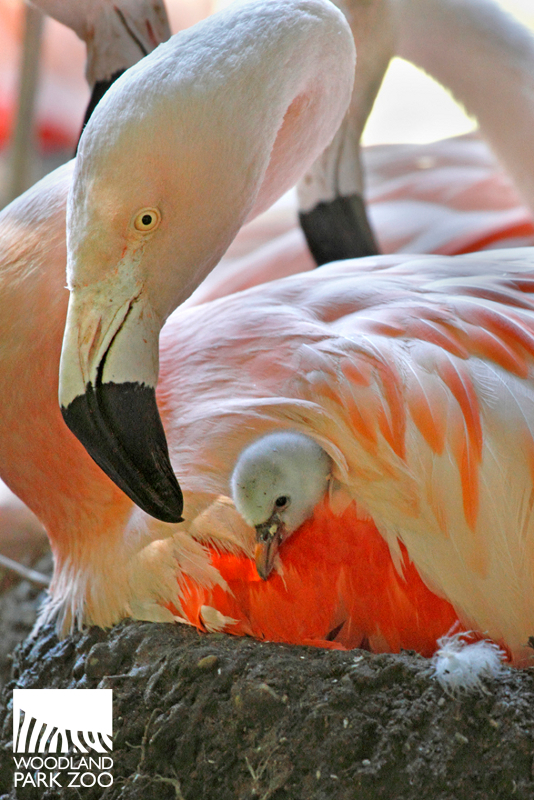 Flamingo chicks hatch with a whitish, gray down and start to acquire their pink feathering at about 1 year of age, though it can still be mixed with gray-brown contour feathers until they are 2 to 3 years old. 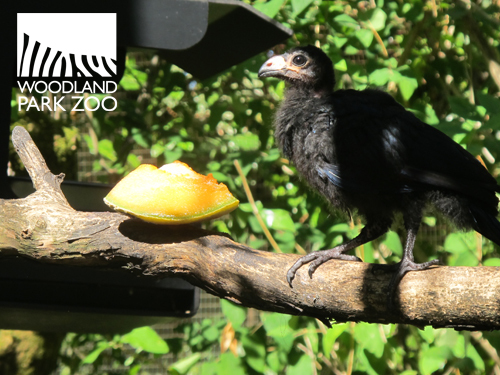 The chicks hatched on exhibit between August 31 and September 5 following a 29-day incubation period. To ensure a higher chance of survival, the chicks and parents have been relocated behind the scenes to a quieter off-exhibit nursery for rearing. As they get bigger and hardier, we will reintroduce them back out on exhibit and back into the flock. Photo by Kirsten Pisto/Woodland Park Zoo. 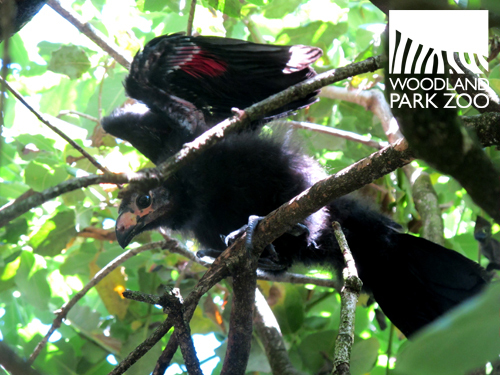 The chicks, both boys, hatched a day apart on July 31 and August 1. Even though they have fledged the nest, these two stick together and follow each other from branch to branch. As this little chick stretches out, you can see his soft down. They are just starting to get their primary feathers and coloring. Zookeeper Katie Ahl told us she can see their beaks beginning to change color already! 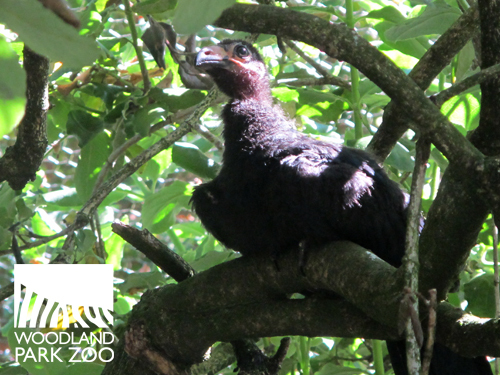 Here is a photo of an adult violaceous turaco. They have a really beautiful dark violet plumage with striking crimson primary flight feathers. Their orange beaks, as you can see, are also very bright, as well as their yellow forehead and scarlet top. Sluurp! Good thing these chicks are lightning fast hunters! 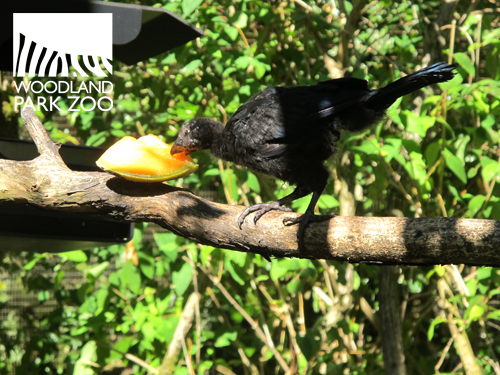 Actually, points out zookeeper Matt Mills, turacos aren’t the best flyers, but they don’t need to be, because who needs to chase fruit? 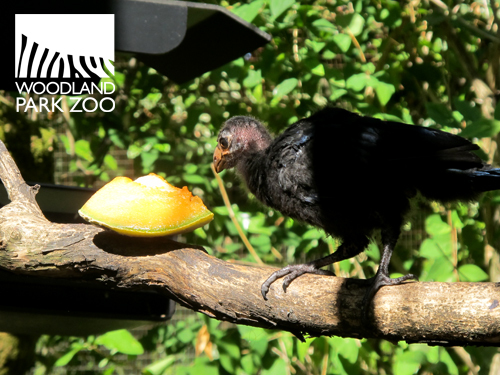 At the zoo, violaceous turacos eat papaya, banana, pear, apple, grapes and blueberries. This clever chick knows that being fed always tastes better! 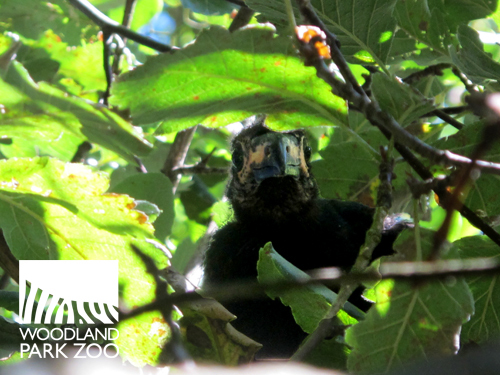 The chicks are hard to spot up high in their leaf forts, but Katie says she can sometimes hear their quiet peeps if they are near each other or their parents. Matt says they are getting more confident out in the exhibit and spending less time in holding. 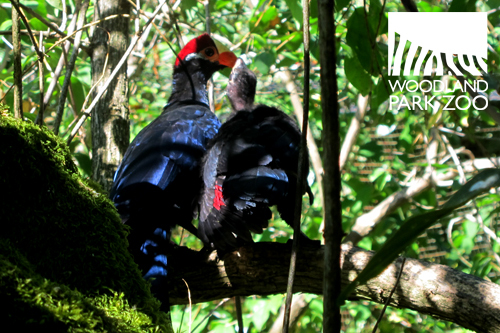 Violaceous turacos, Musophaga violacea, are native to tropical West Africa in forests with large fruit trees and mangroves. 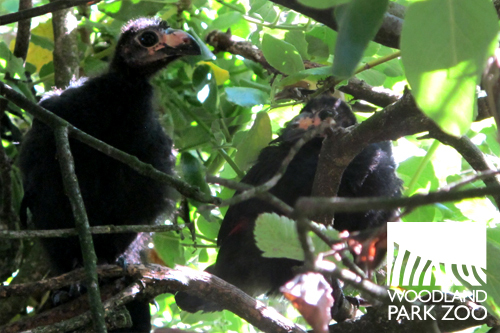 They are almost always seen in pairs and build platform nests out of sticks high in the treetops. 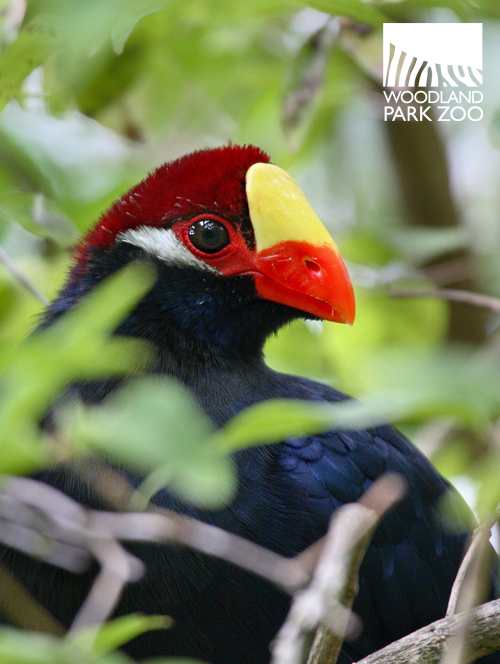 There are only 73 turacos in 38 zoos in North America so we’ll be moving them to new homes as soon as they can be placed. 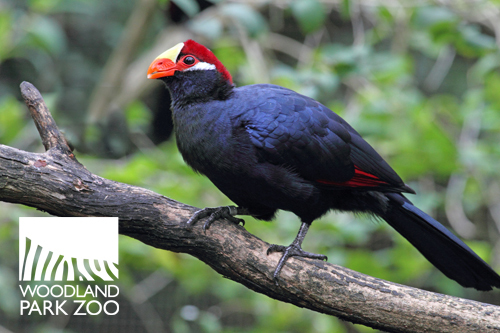 You can visit the turacos in the Savanna Aviary. The chicks won’t be in the exhibit too much longer, as they will be moved off exhibit to avoid being injured by their parents. Be patient and listen for their loud cooroo-cooroo call, then you’ll spot the brightly colored beaks! Our sloth bears Randy and Tasha were out in full regalia Tuesday, sniffing, scratching, balancing on logs and slurping their favorite foods—all to greet 200+ zoo lovers and advocates who gathered to help us celebrate a major milestone: breaking ground on the new Asian Tropical Forest exhibit complex! 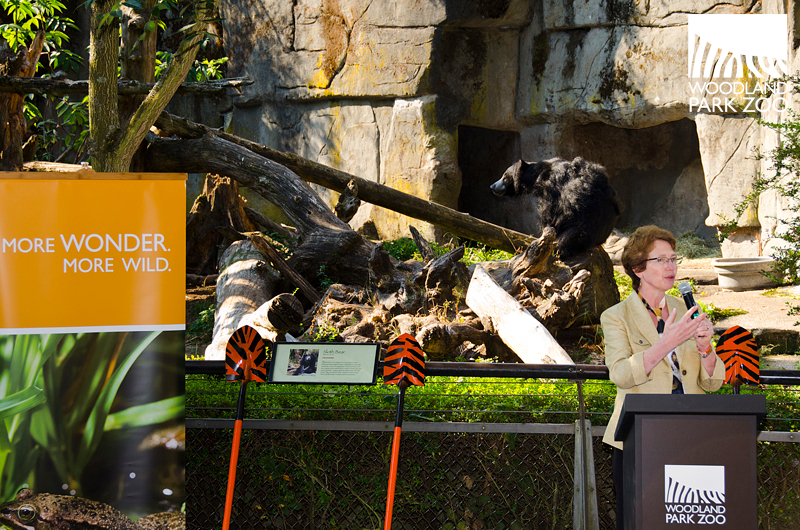 Assisted by sloth bear Randy, President and CEO Deborah Jensen spoke about design and animal care innovations at the Asian Tropical Forest groundbreaking ceremony Sept. 18, 2012. Photo by Ryan Hawk/Woodland Park Zoo. Nearly 100 additional zoo fans of the smaller variety “dug in” to make way for new homes for Asian small-clawed otters, sloth bears and Malayan tigers. Kids from Orca Children’s Center, North Seattle Fives Cooperative and West Woodland Elementary School joined the ceremony. Photo by Ryan Hawk/Woodland Park Zoo. The kids also did a great job of overseeing the work of several leaders of the Asian Tropical Forest capital campaign, donors and public officials. The leaders’ mission? 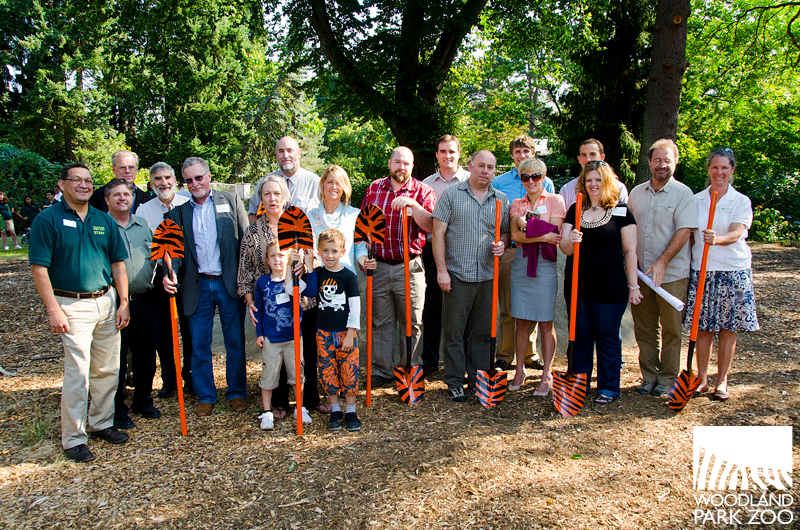 Earn their stripes by filling the tiger shovels, of course. Over and over and over again. (L-R) WPZ Board Chair Stuart Williams, Vice Chair Nancy Pellegrino, Seattle City Councilmember Nick Licata, donor Allan Osberg, Representative Jamie Pedersen (D-43), donor Lisa Simonyi and CEO Deborah Jensen. Photo by Ryan Hawk/Woodland Park Zoo. The most progress, however, was made by our design-build team members. There is a lot of terrain to prepare and myriad exhibit components to create for the new 2-acre complex. Here they are taking a hard earned break. Some of the Asian Tropical Forest design-build team members: WPZ professional staff, lead designer Studio Hanson/Roberts, general contractor Berschaeur Phillips, and SvR Design Co. Photo by Ryan Hawk/Woodland Park Zoo. It wasn’t all work and no fun! This is the zoo, after all. Kids learned how to make elephant poo paper (eeew! cool!) 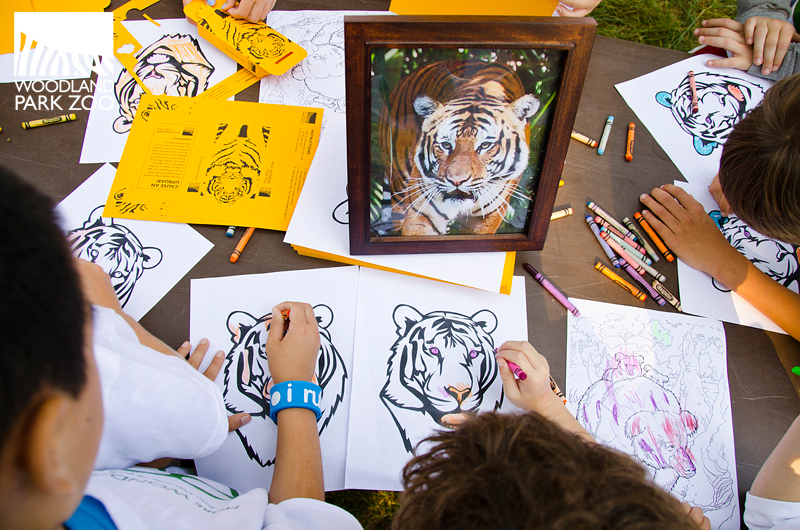 and sharpened their wildlife art skills, crayons in hand (and sometimes out of hand). Budding wildlife artists. Photo by Ryan Hawk/Woodland Park Zoo. The night before, to help kick things off, King 5’s Evening Magazine took viewers behind the scenes with our animal experts to witness the sloth bear’s unusual, vacuum-like feeding adaptations – which the film crew dubbed “the zoo’s hairiest appliance.” Check out those live meal worms! We can’t wait to post updates and behind-the-scenes peeks at our construction progress as these new animal homes come to life. If you’ve followed our previous Asian Tropical Forest postings, you know just how extensive and innovative this heart-of-the-zoo transformation is. Asian small-clawed otters exhibit opening 2013. Photo courtesy of Santa Barbara Zoo. When phase one opens in May 2013, you’ll meet Asian small-clawed otters for the first time and a variety of tropical birds. Kids will get super hands on in a new nature-play area designed to stimulate their cognitive, emotional and social development. Nature-play area for kids opening 2013. Concept rendering by Studio Hanson/Roberts. 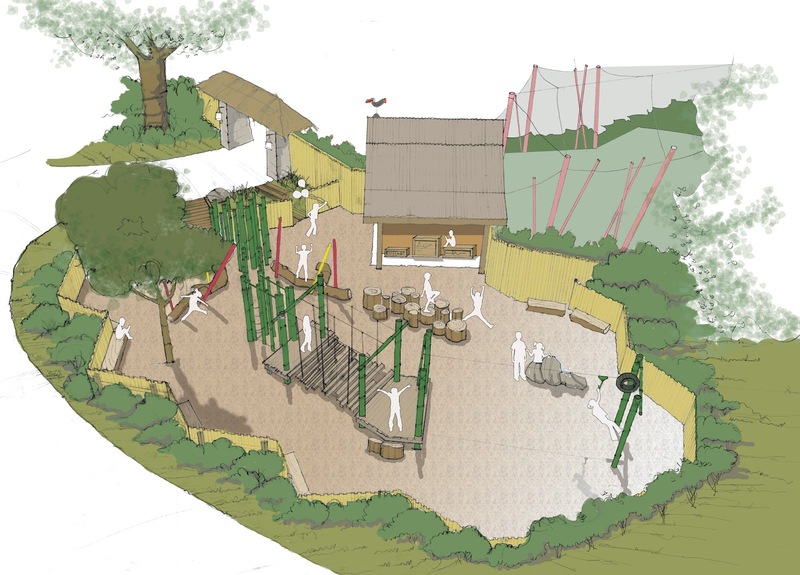 We continue to raise funds for phase two of this amazing new complex – the new homes for sloth bears and Malayan tigers, which we anticipate opening in 2014. When all done, this community will have a new natural wonder like no other. Check out the Get Your Paws on Our Exhibit promotion and follow the More Wonder More Wild campaign’s progress at www.morewonder.org. Thanks for your support! Asian elephant Bamboo shows us how bath time is done. 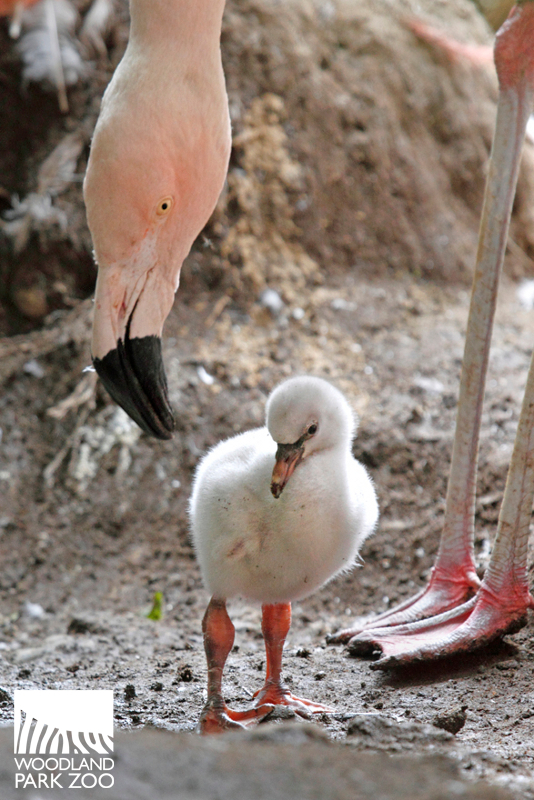 Video by Ryan Hawk/Woodland Park Zoo. 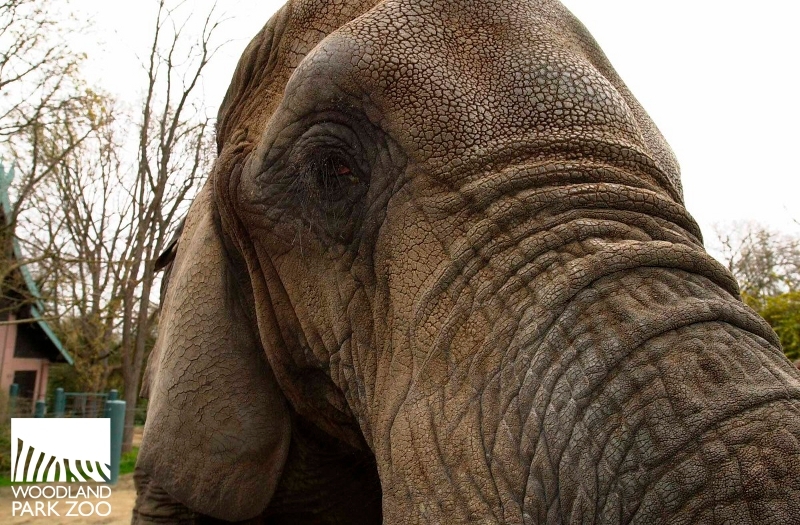 From Borneo to Seattle, elephants embrace their bath time. We all know the feeling when you first step into the shower after working in the yard all day. Elephants at Woodland Park Zoo not only get an extended, luxurious shower, they also enjoy a quatro-pedi and a good exfoliation with a special elephant brush. Watoto gets a massage with a special brush. Photo by Ryan Hawk/Woodland Park Zoo. I recently had the pleasure of joining the elephant keepers as they brought Watoto into the shower barn. There she greeted them with a long, trunky sniff and then was ready for her bath with the garden hose. Her giantess turned attentively as she followed her keeper’s soft commands, “Watoto right, Watoto turn, Watoto back.” All the washing while, she was inquisitively seeking that next snack. Carrots seem to be her treat of choice. 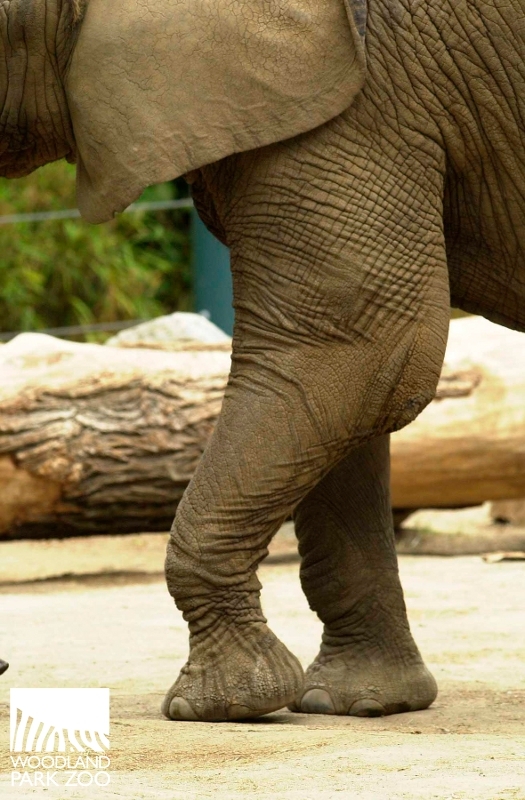 Asian elephant Bamboo demonstrates how cooperative the zoo’s elephants are with their foot care. Even more outstanding was her sheer willingness to lift each foot, easily balancing on the other three while another keeper gave her a good pedi scrubbing with nail cleaning and check. 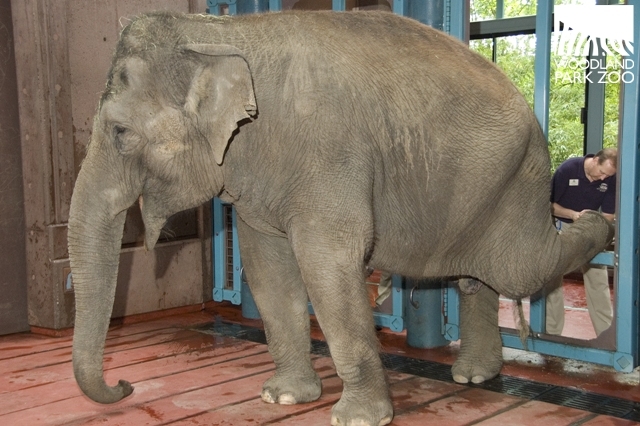 Once her feet were cleaned, Watoto was then scrubbed with a disproportionately small bristle brush. Just like when you have that impossible itch between your shoulder blades that only a dear one can scratch for you, it was clear Watoto was having a similar “ahhhh” moment as when you finally get the itchy spot resolved. For her it seemed those little folds just near her ears were the “Can you get that for me?” itchy place. Asian elephant Chai takes a sip...OK, more like a big gulp during bath time. 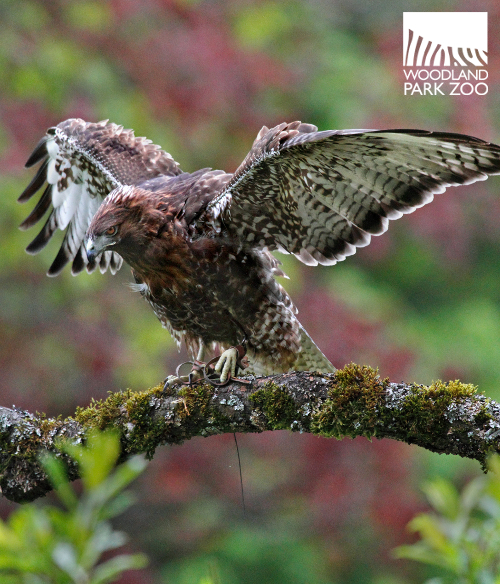 Video by Ryan Hawk/Woodland Park Zoo. Then came the tongue rub and mouth check. Watoto’s bright pink tongue changed shapes as her keeper inspected her teeth. She then took that hose like a giant straw and had a very long sip, which was probably just a drop in that bucket of an elephant tummy. Watoto gives drinking from the fire hose a whole new meaning. Helpful Watoto returns a food dish to her keeper. Photo by Ryan Hawk/Woodland Park Zoo. All of this showering and pedicuring serves a much larger purpose than just washing the dirt off. 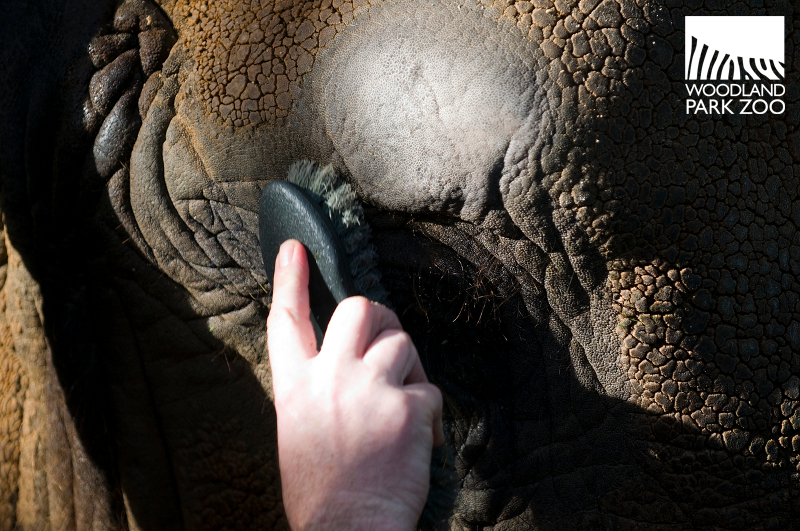 The elephant spa provides the keepers with an opportunity to do their daily overview of her skin, feet, tongue, teeth, bum, belly, back, and emotional state. She certainly seems to enjoy the lavish, caring experience; certainly there is an enthusaiasm to partake in the activity well beyond the carrot-based incentives. Watoto up close. Photo by Dennis Conner/Woodland Park Zoo. Watoto outside. Photo by Dennis Conner/Woodland Park Zoo. 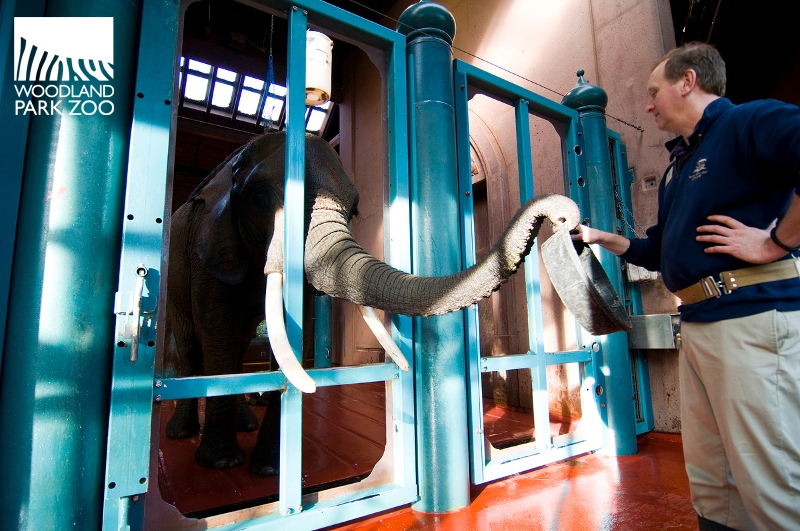 You can see the elephants get their baths in the morning at the zoo’s Elephant Barn in the Elephant Forest exhibit. There’s no exact schedule since the elephants call the shots, but baths usually start around 9:30 in the morning and can go for an hour or two in the barn. 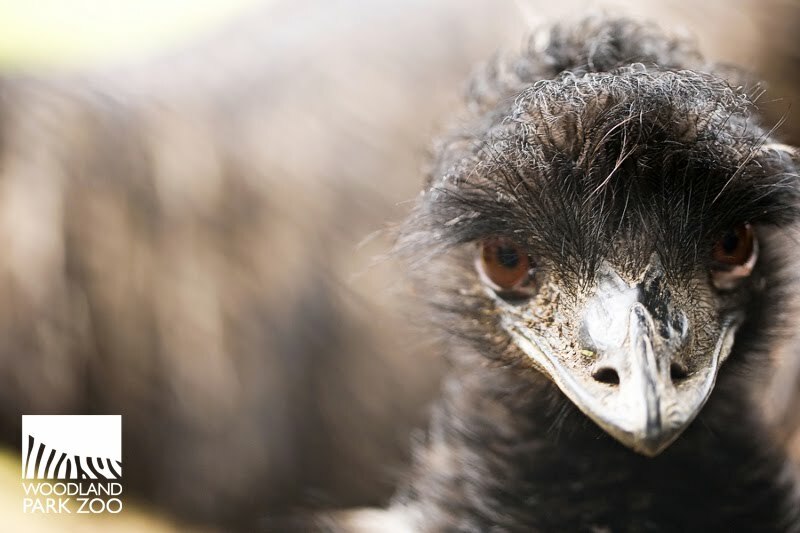 Emu feathers are designed to hang loosely, which helps keep them cool but also gives them an appearance of having hair rather than the tightly barbed feathers we’re used to seeing on most birds. Photo by Mat Hayward/Woodland Park Zoo. This week, Woodland Park Zoo took home two national conservation awards from the Association of Zoos & Aquariums (AZA), the accrediting organization for more than 200 zoos and aquariums in North America. An Oregon spotted frog is released into Northwest habitat. Photo by Ryan Hawk/Woodland Park Zoo. We won top honors in the North American Conservation Award category for our collaborative Oregon Spotted Frog Reintroduction Project, along with our partners Oregon Zoo and Northwest Trek. 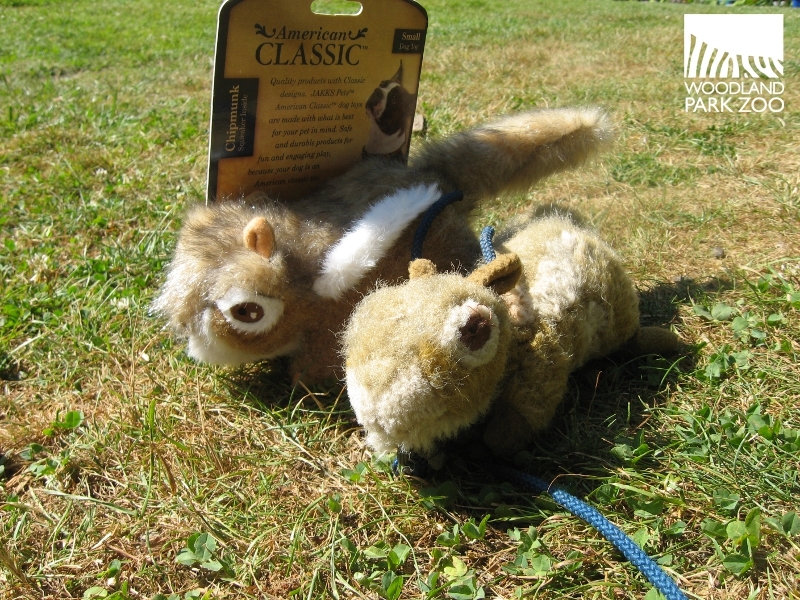 Woodland Park Zoo and Oregon Zoo also earned the Significant Achievement Award for the Oregon Silverspot Captive Rearing Program. These awards represent the 14th national and international honors in conservation for us from AZA. 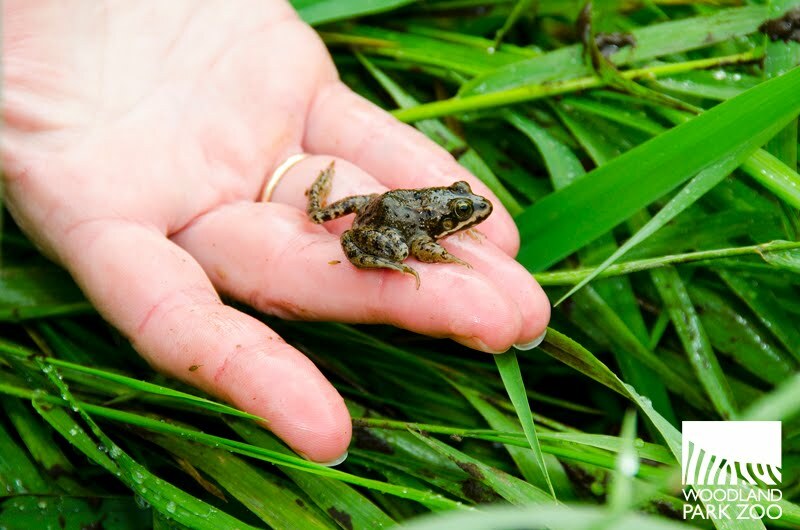 The Oregon Spotted Frog Reintroduction Project is a six-year collaborative effort among Woodland Park Zoo, Oregon Zoo, Northwest Trek and other conservation leaders in the Pacific Northwest. Populations of the native Oregon spotted frog have been decimated by 80 to 90 percent in Washington state. But Woodland Park Zoo and its partners joined to institute a recovery program to restore the endangered frog populations and get them back on their feet. The frogs are collected from wetlands as eggs and placed at the zoos for hatching and rearing for several months in a predator-free home as they transform from tadpole to full-fledged frog, giving them a head start until they are large enough to avoid predators that might prey upon them. 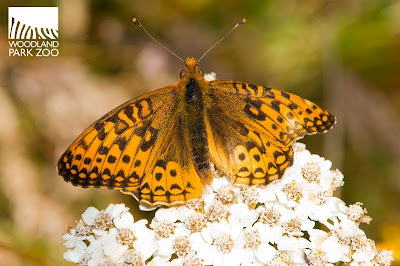 Oregon silverspot butterfly. Photo by Ryan Hawk/Woodland Park Zoo. Woodland Park Zoo joined Oregon Zoo and other conservation leaders in a collaborative habitat restoration and reintroduction program to help increase the silverspot butterfly population in the Pacific Northwest. Program partners raise eggs in captivity until they become pupae and are ready to change to adult butterflies. They are then released into a protected area on the Oregon Coast in an ongoing effort to augment the population. A porcupine’s front teeth continue to grow throughout its life. That’s helpful since it spends its days constantly gnawing on hard substances, wearing down its teeth. Mmmm, tree bark. 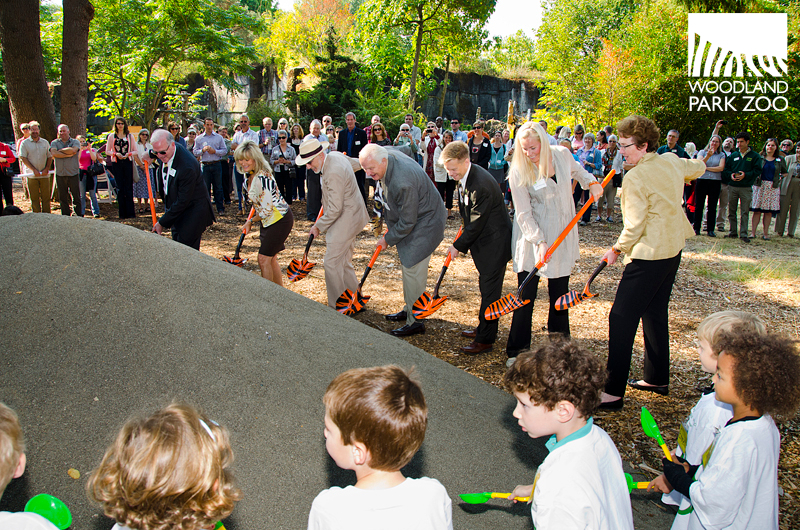 We’re about to break ground on phase one of our all new tiger, sloth bear and otter exhibit complex, and that means we’re coming up on the final weekend—Sept. 15 – 16—to view sloth bears Randy and Tasha at the zoo before construction begins. Sloth bear at Woodland Park Zoo. Construction for a new exhibit complex begins Sept. 17, 2012. Photo by Dennis Dow/Woodland Park Zoo. Once construction begins the week of Sept. 17, we’ll be closing off the area where the sloth bears live now and they will remain off public view until both phases of the construction project are complete, which we anticipate will be in 2014. 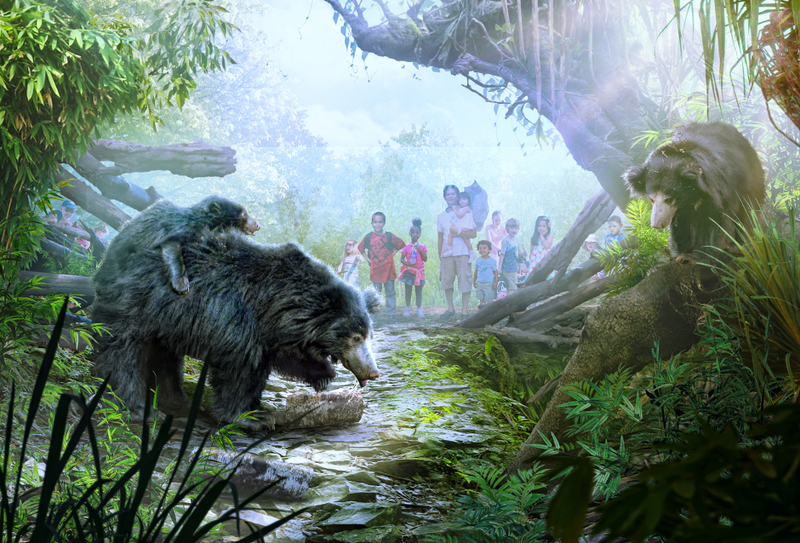 The new exhibit complex will transform a 60-year-old portion of the zoo into a state-of-the-art, 2-acre complex with dynamic new homes for several species of the Asian tropical forest—Asian small-clawed otters, sloth bears, tropical birds and Malayan tigers. Asian small-clawed otters. Photo courtesy of Santa Barbara Zoo. When phase one of the major new exhibit complex opens in May 2013, visitors will meet a new addition to the zoo—the Asian small-clawed otter—and enjoy a new children’s play area. We’ll continue fundraising and then constructing phase two of the exhibit, which will feature sloth bears and Malayan tigers, and aim to open that in 2014. In the meantime, Randy, our 16-year-old male sloth bear, and Tasha, our 7-year-old female, will remain at the zoo together but will not be visible to the public during construction activity. Randy and Tasha were paired up by a breeding recommendation from the Species Survival Plan (SSP) for sloth bears, an Association of Zoos & Aquariums’ program that seeks to maximize genetic diversity, with the goal of ensuring the long-term survival of the population and the health of individual animals. SSPs also involve a variety of other collaborative conservation activities such as research, public education, reintroduction and field projects. Sloth bears—native to Bangladesh, Bhutan, India, Nepal and Sri Lanka—are an endangered species. Fewer than 10,000 remain in the wild. Their survival is challenged by fragmented populations, deforestation and the bear parts trade. Sloth bears are very rare in zoos, with fewer than 50 currently living in North American zoos. Artist rendering of new sloth bear exhibit at Woodland Park Zoo. In the new sloth bear exhibit at Woodland Park Zoo, you’ll see, hear, and smell the lively bears as they interact with state-of-the-art enrichment opportunities throughout their new home. They’ll use their sense of smell and dexterity to retrieve food hidden in digging pits, crack into marrow as they break open bones in a specially designed bone-breaking pit, slurp grubs out of logs in their dry ravine landscape and put their vacuum-like eating style to work at a keeper-assisted feeding demonstration. We’re currently raising funds to make this amazing new exhibit complex possible, and your help is appreciated! A gift of any size helps make a new home for these animals a reality. Through our Get Your Paws on Our New Exhibit promotion, those who donate $1,000 or more to the Asian Tropical Forest initiative will get their name on a decorative paw print tile featured prominently at the entrance to the new exhibit complex. To order a paw, or to follow the progress of the More Wonder More Wild comprehensive campaign, go to www.morewonder.org. It’s me, Squeaky. Photo by Gretchen Albrecht/Woodland Park Zoo. Hi, I’m Squeaky the squirrel. 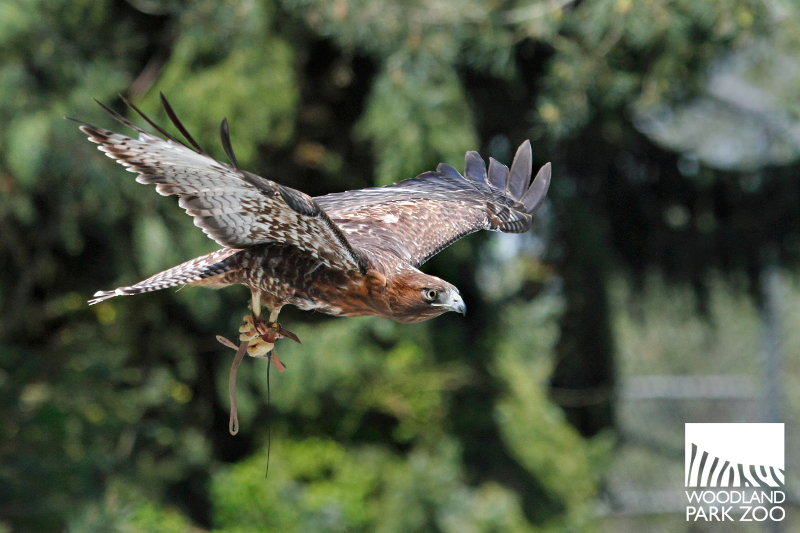 I work at Woodland Park Zoo’s Raptor Center as a hawk lure. It’s been a busy summer for me. I thought you might enjoy hearing about my job. 8:00 a.m. - Time to get up. 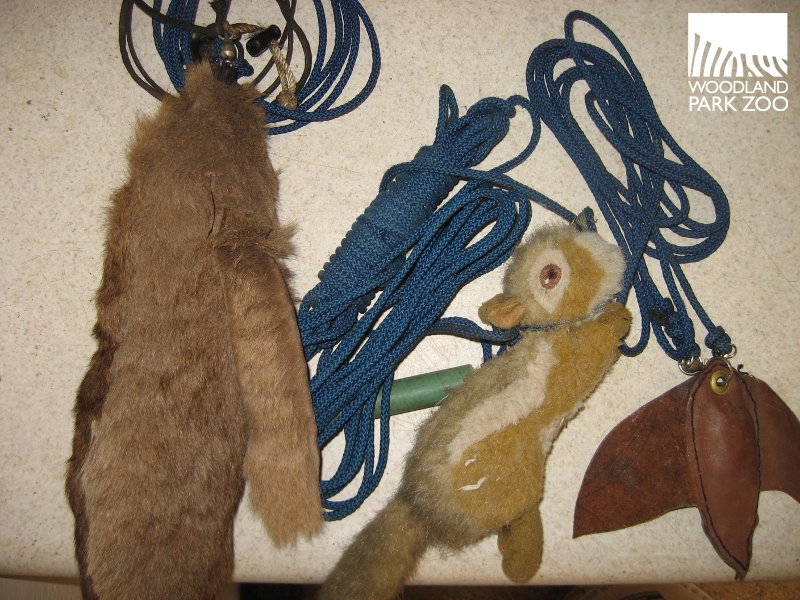 I rest with two other lures, the “dummy bunny” used for the ferruginous hawk and golden eagle, and a swing lure used for the Aplomado falcon (it is supposed to look like a bird). Obviously I am the cutest! 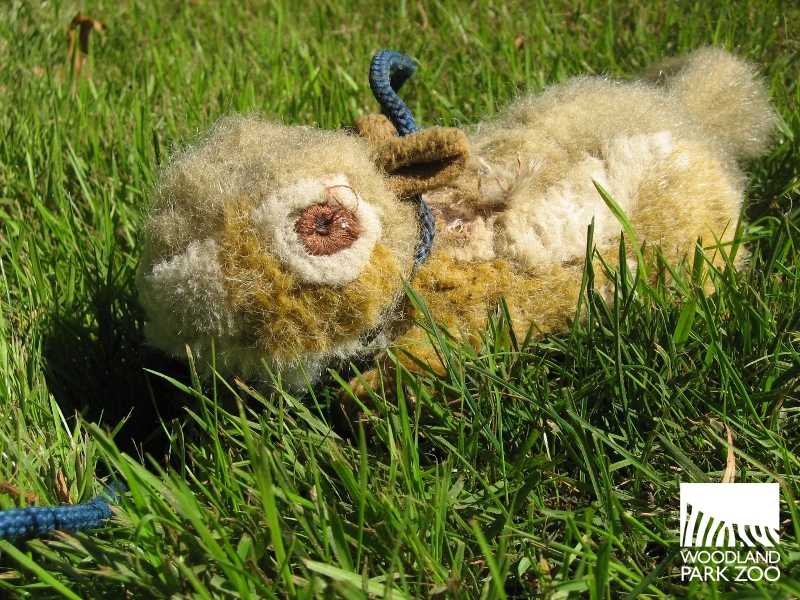 Chillin’ with the dummy bunny and swing lure. Photo by Gretchen Albrecht/Woodland Park Zoo. 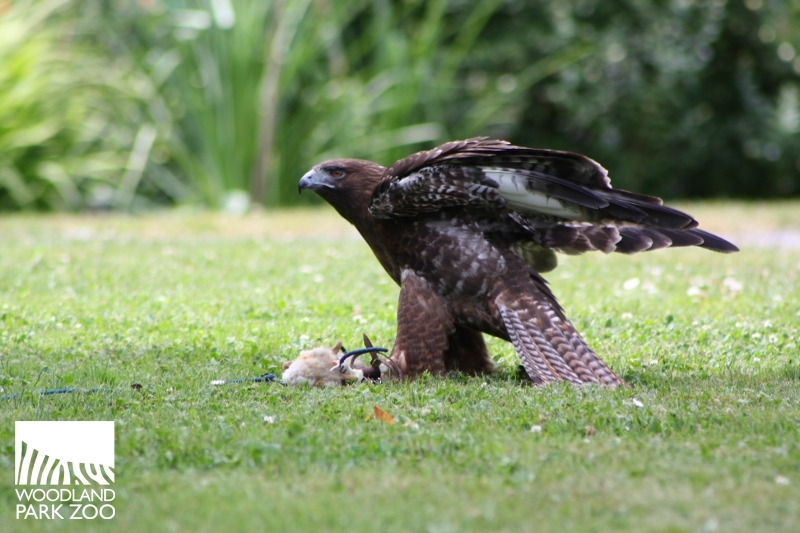 Lures are an important part of training a raptor to safely free fly. The lure usually represents the raptor’s natural prey. After getting a meal or two on the lure a raptor is generally pretty keen to fly to it since the lure means food. Flying to a lure is a lot more fun than flying to a trainer’s glove so a lure is often used when a raptor has gone off course and is perched in an unfamiliar location where it may be uncomfortable. Mornings are busy around the Raptor Center with lots of cleaning and preparing the birds for the flight program. I watch the activity from my shelf. Hello, Gunnar! Photo by Gretchen Albrecht/Woodland Park Zoo. 11:30 a.m. - Time for me to go to work! A keeper ties a piece of mouse meat to my back. This is a reward for the red-tailed hawk, Gunnar, who swoops down and grabs me. I am taken to the presentation yard and hidden under a black tub so Gunnar doesn’t see me prematurely. 11:45 a.m. - The pre-show music starts. It’s almost show time. My co-star, Gunnar, in flight. Photo by Dennis Dow/Woodland Park Zoo. Noon - The show begins. 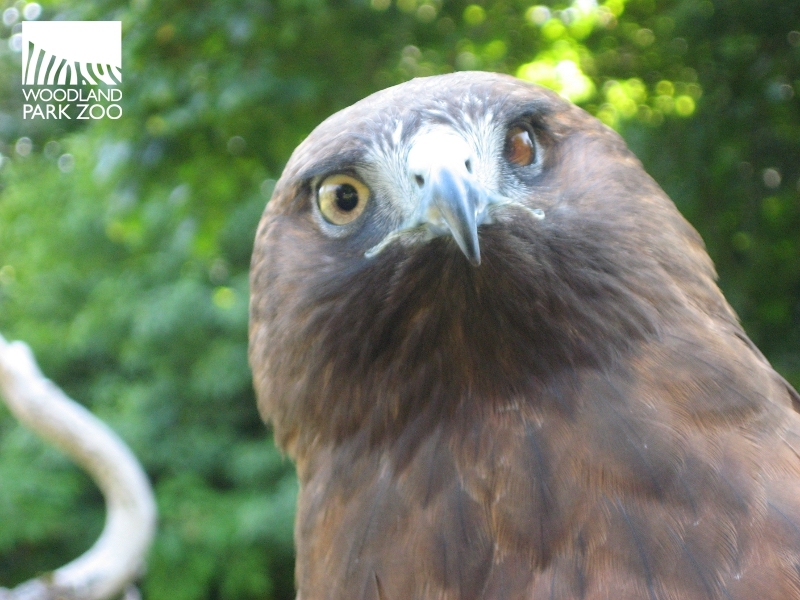 This summer I am working with the red-tailed hawk, Gunnar, who is second in the line-up. 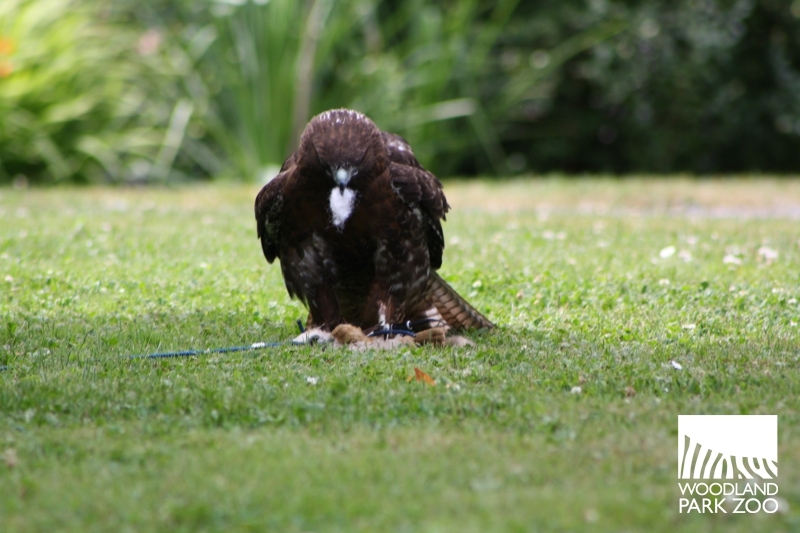 Last summer I worked with the Harris’s Hawk, Cisco. He would fly out of the big maple tree and grab me. He really liked to squeeze me with his feet. This summer Cisco flies before Gunnar and sometimes he comes down to look for me under the fake rock. He remembers his routine from last summer; he is a very smart hawk! Cisco the Harris’s hawk. He just can’t forget me. Photo by Gretchen Albrecht/Woodland Park Zoo. 12:05 p.m. – It’s my turn! I am pulled out from under the tub by the keeper. Gunnar swoops over the audience and grabs me with his feet—WHAM! He likes to jump around with me in his feet and pluck at my fur as he looks for his piece of mouse meat. Gunnar pins me with his talons. It’s all fun and games until someone gets hurt. That someone is always me, it seems. Photo by Regina Smith/Woodland Park Zoo. 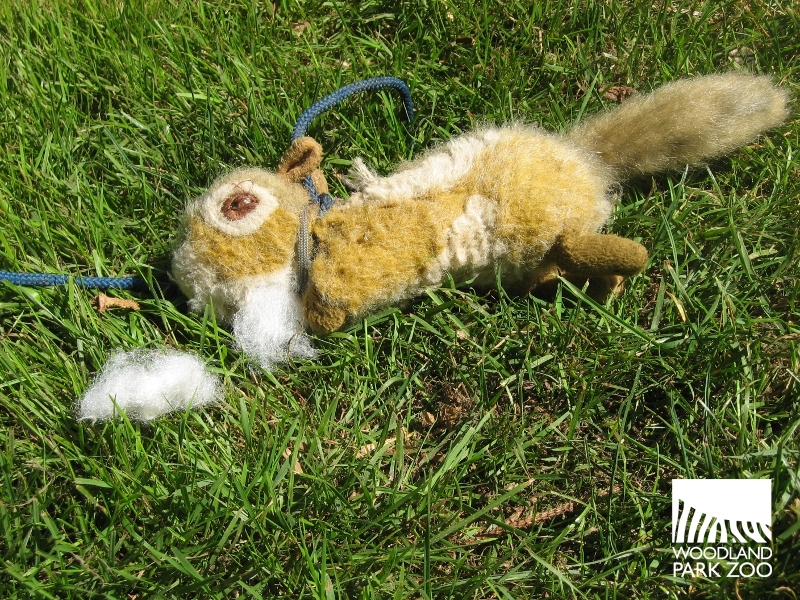 Sometimes he pulls out my stuffing by mistake—ouch! After Gunnar has eaten the meat, the keeper tosses him another piece of mouse as a trade for me. As Gunnar runs off to get the mouse meat, I am quickly hidden behind the keeper’s back and stashed under the fake rock. Pulling out my stuffing. Photo by Regina Smith/Woodland Park Zoo. 12:07 p.m. - Sometimes Gunnar flies into the trees instead of off to the keeper. I get pulled out again and Gunnar gets excited. WHAM! He grabs me again. Gunnar loves me! This is what happens when Gunnar loves you. Photo by Gretchen Albrecht/Woodland Park Zoo. 12:30 p.m. - The show is over and it’s time for a break. I get to rest inside and we have lunch. Gunnar takes a break from flying. Photo by Dennis Dow/Woodland Park Zoo. 1:30 p.m. - It’s time to get ready for the 2:00 p.m. show. Let’s do it all over again! I take some time out to train the new guy. Photo by Gretchen Albrecht/Woodland Park Zoo. The raptor flight programs run through the end of September, Wednesdays – Mondays at noon and 2:00 p.m. Come by and see me in action. I noticed a new squirrel in the office the other day. It looks like this may be my last summer. I will miss the hawks when I retire. 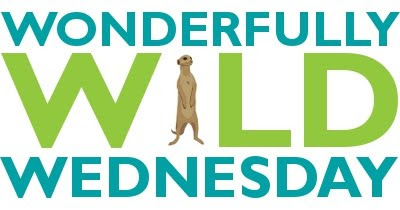 Wonderfully Wild Wednesday: Those lashes!